This post was originally featured on Maison Cupcake. Today we go to chocolate heaven and back. This place is truly wonderful. I discovered it on holiday this summer in St Malo, Brittany. 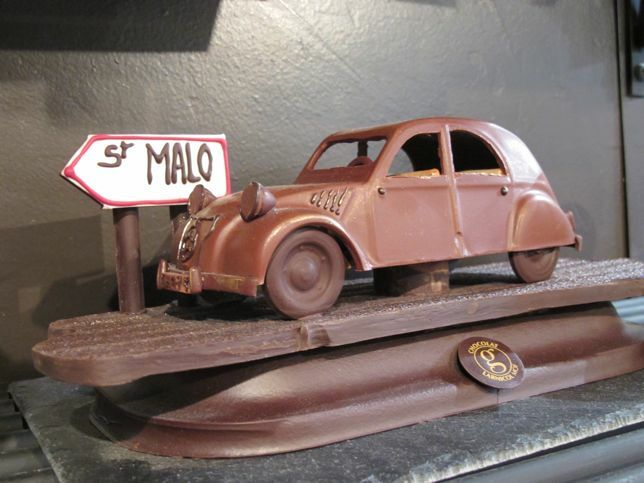 It’s called Maison Larnicol and sells a fabulous range of sweet treats. I was stamping around St Malo in the footsteps of the delightful and hopelessly chocolate addicted Kerrin of My Kugelhopf who had seduced me with her posts Salted Butter, Sugar and Oh some Flour too and Got Milk? That’s All You Need in search of the Maison du Buerre and other Kerrin haunts. She never told me about Maison Larnicol so today I attempt to out Kugelhopf the Kugelhopf but I’ll never top those blog post headlines *must try harder*. It’s a dark little shop with wall to wall wooden cabinets of buttery Breton biscuits and chocolate and serve yourself tongs to fill up your paper bags. Think “scoop and save” but classy. Not only do they sell macarons but chocolate grand pianos. And chocolate SHOES. Who needs Laboutin eh? “Les Chocolates Self Service”. I love it when the French adopt English words as their own, like le weekend although it too me a while to realise that om-bugger was not something rude. Les Galets. AKA big fat discs of chocolate with fruit and nuts on them. Which count towards your five-a-day. These ones look more like olives than olives do. And some massive coloured meringues. Must make these some day. Sucette, French for lollipop, is a word that always makes me snigger and never more so than at the sight of these little chaps. With a bite taken out, just to taunt you. These are pistacho flavour kouign amanns. Read Kerrin’s piece for the low down on what these babies are all about. Detailed research is not my strong point right now. Is this the way to St Malo-rillo? Gulls egg chocolates and rocher – not to be confused with the Ferrero variety. Inside the gull’s egg. Caramel. Chocolate down fingernails too. Which proves I was enjoying myself. Framboise macaron heaven, quite possibly my favourite macaron ever. Photographed for posterity. And hey who’s this? The little boy who fortunately for me, prefers Kinder Surprise.